Tara Oram Official Blog 2008 | Tara Oram Official and Personal Blog, Tara Oram, an inspiring Canadian country musician, transcribes her thoughts and ambitions, and shares her music with her fans. Tara Oram Official and Personal Blog, Tara Oram, an inspiring Canadian country musician, transcribes her thoughts and ambitions, and shares her music with her fans. 6 more days until the release!!!!! So excited!!! I want to start off by saying a HUGE THANK YOU to everyone who submitted a song in my “Fan Song Contest”. Again, thank you to everyone for your hard work and keep chasing your dreams! 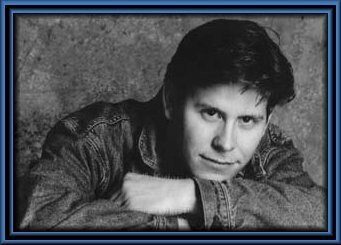 And the winner is………………………………………..JEFF CALLERY for his song, “THE CALL”. “This song was inspired by a good friend of mine who was killed in combat in Afghanistan in April of 2006. Until that day, the role and history of the Canadian Armed Forces was intangible to me. Symbolic and proud, but intangible. November 11, 2006 was the first time I had ever really been connected to our Forces heroic past, dynamic present and important future… and like everything else in my life, I had been unable to express the emotions I had felt – so I wrote “The Call” with the help of my wife Paula and our kids, Tegan and Gabrielle. It’s kind of funny, but if you ask my children what I do for a living, they would likely say that I get dressed in a suit, go out for lunch and come home in time to make sure the homework and chores are done. They might also say that sometimes, I get to go out and play music for a bunch of people and have a great time… either way, not a bad way to spend a working life. Shortly after we got word of what happened to my friend, they asked me that if someone could choose to do what I did, why would someone choose to do what soldiers did? Why would someone put themselves in dangers way for others? Why would someone go so far away from the ones they love to protect people they didn’t know? I didn’t have an answer… so we wrote the song. “The Tara Diaries” Marathon on CMT!!! So, just when you thought the series was over, there will be a marathon this Sunday night (Sept 14) from 9pm-12pm EST on CMT!!!! Wooohooo!!! I recently did a video blog on my facebook to update you all on what’s new but, I thought I would write a blog about some of things that have been happening lately, and what will be happening in the near future! Just yesterday, I returned to Toronto from my trip home to Hare Bay. I had a few days of being with my friends and family and it was just so great to be HOME! I would like to send my condolences to the families of Nicey Humphries and Kathleen Davis. May you both Rest in Peace and you will always be in our hearts. “FLY GIRL” has cracked the top 10 on the Chevy Cross Canada Countdown! Wohoo!!! This is such a huge accomplishment and I’m so thankful to all of you for requesting and voting! I’ll be hosting CMT Music this coming weekend! Ash is away in Hawaii (lucky bird!!!) and I’ll be filling in for her this weekend. I miss you Ash and be safe down there! Although “The Tara Diaries” is over, you can still vote for the Fan Submitted Song, my outfit for my next video, the last song to go on my album AND MY ALBUM COVER!!! Go to CMT.ca and click on “On Tv” then click on “The Tara Diaries” to vote for all of your faves! HAVE FUN! I’m so glad to have you guys included on the decision making! Makes my life easier! lol..
OH! I’ll be heading out to the CCMA’s in Winnipeg and I’ll be performing at FANFEST! I’m SO excited because I remember attending FANFEST in New Brunswick and now, I GET TO PERFORM THERE! How cool is that!? I can’t wait to meet you guys and if you’re in the area, be sure to drop in to say HI!! I think that’s it for me, for now.. lol. Love you guys and mwa mwa mwa! 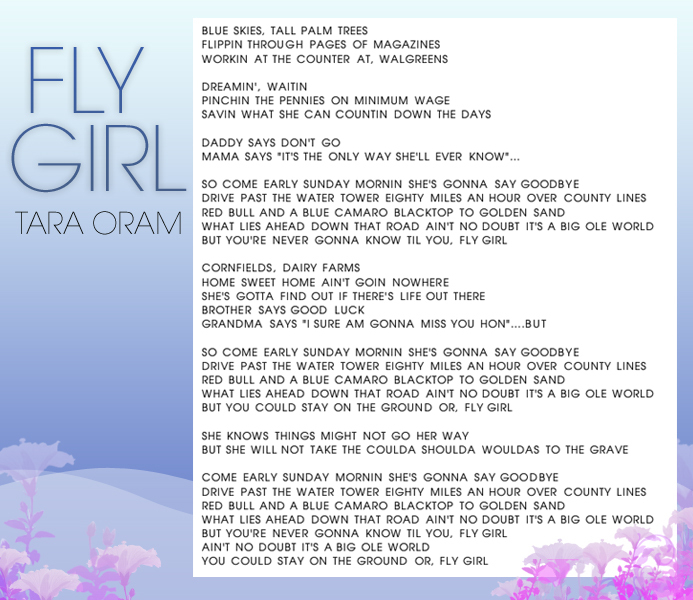 Hey guys, some of you asked me to post the lyrics to Fly Girl, so here it is! I also posted it on my Music Video page as text. As you all know, my TV show premiered on CMT last Sunday. Since I am in Nashville, I had to watch it over webchat with Brian! lol..
I’ll tell ya, I was a nervous wreck all day about this premiere. We’ve been shooting for a couple of months and finally, it was the big day!!! I wish I was in Canada to actually watch it on TV but, I have a lot of work to do here in Nashville. We’re still filming pieces of the show down here. I will be returning this Sunday so, I’ll be able to watch episode 2 on my own tv!!! Woo!! Thank you guys so much for your messages and I’m so glad you guys like it. It means the world to me that you enjoyed it!!! Episode 2 airs this Sunday @ 9pm on CMT! Hey guys, I am going to be featured at the beginning of tonight’s show. Please check it out!